This is the thirty-ninth in a series of posts that report on the state of the parties as measured by opinion polls. By pooling together all the available polling evidence we can reduce the impact of the random variation each individual survey inevitably produces. Most of the short term advances and setbacks in party polling fortunes are nothing more than random noise; the underlying trends – in which we are interested and which best assess the parties’ standings – are relatively stable and little influenced by day-to-day events. If there can ever be a definitive assessment of the parties’ standings, this is it. Further details of the method we use to build our estimates of public opinion can be found here. This month’s Polling Observatory comes after a month of political twists and turns – most notably with the resignation of Baroness Warsi over the Israel/Gaza crisis and the general election gate-crashing act performed by Boris Johnson. Last month we reported a slight rebound in the polls for Labour but were cautious over the presence of a ‘Junker’ bounce in Conservative fortunes, despite much fanfare in the media. This month’s estimates suggest the Conservatives have made some recovery, but despite one poll putting the Conservatives ahead, and another showing Labour in front by 8%, the underlying position remains a narrow but significant Labour lead. The Conservatives have posted a solid gain in support in July, rising 1.2 points. They now are at 32.0%, close to their highest level of support since the beginning of 2012. However, Conservative support still remains within the 30-32% band they have settled into for over two years, a band they must break out of to have any prospect of being the largest party in 2015. Labour also gained significantly this month, up 0.7 points, at 35.3%. This blunts the impact of the Conservative rebound, and is the second significant gain in the row for the party, who are now about 2 points above their low ebb in the late spring, though still well below the high-30s range they typically enjoyed last year. Labour’s lead over the Conservatives is now 3.3 points – close to the all time low found in our March estimate. The narrow gap at the top will give the blues a boost, but the Conservatives are still persistently behind the opposition and time is ticking away. Interestingly, these changes are in line with what we would expect from our forecasting model – with both parties expected to receive greater support in May 2015 than they are currently polling. To some it is difficult to comprehend that Labour is holding a steady poll lead despite the strong negatives of their leader and the continued view from the electorate that the party is partly to blame for the continued economic travails of the UK. However, the reality is that Miliband’s negatives are already ‘priced in’ to Labour support, while Cameron also suffers from relatively anaemic leader ratings by historical comparison. Further, for all Labour’s negatives, the party retains the image of being well-intentioned if flawed and ineffectual, whereas the Conservatives are toxic with large parts of the electorate, and have done nothing to address this, aside from a few last minute electoral giveaways. With Boris Johnson on manoeuvres for the leadership of the party, and several MPs stepping down ahead of the election (including several of the 2010 intake), party discipline is in a fragile state – leaving Chief Whip Michael Gove with a crucial role before the general election. 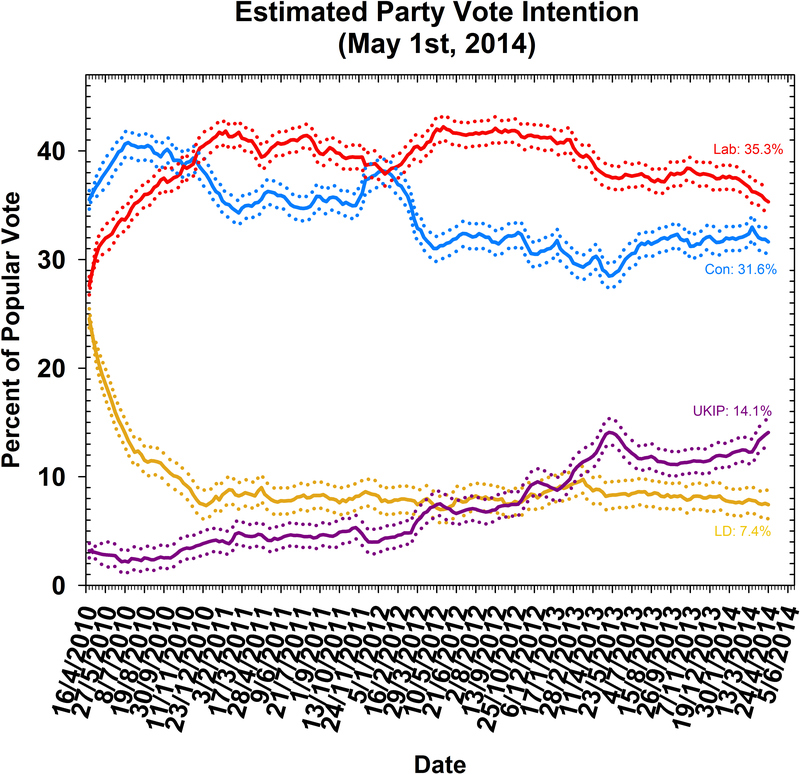 After a sustained surge in support, UKIP have fallen back, down 1.5 points at 13.3%. This fallback is in line with what we saw in 2013, when UKIP surged after electoral success brought them media attention but fell back somewhat over the summer. Last year, the party retained quite a bit of its new support, levelling off at about 10%, several points above their level in 2012. Their current 13% share is well above where they were at this time last year, but only time will tell whether they are able to retain the new recruits won in the European campaign. The UKIP narrative surely will return to the top of the media agenda ahead of the May 2015 general election, providing the party with another possible shot in the arm, and UKIP’s membership and political donations are currently at record highs. Farage’s fox is not shot yet. Despite their fall-back, UKIP remain well above the Liberal Democrats who are flat-lining below the 10% level, specifically, at 8.8%, with no change on last month. For both parties, however, the national share of the vote will be less important than their local strength in seats that they are trying to take or hold. The recent Ashcroft poll of Tory marginals revealed that UKIP is outperforming their national figures considerably where they have a strong local campaign – and where features of the constituency are in their favour. Earlier Ashcroft marginals polling suggests that the Liberal Democrats also do better in the seats where they are well entrenched and seeking to hold off Conservative challengers, though Clegg’s party is in deep trouble when Labour is the challenger. The same story also applies, to a lesser extent, to the larger parties. Strong incumbents often enjoy a local bonus in support which can help them weather a national swing away from their party, while weak challengers can under-perform. The local social and demographic mix of a seat can also play an important role – as seen in 2014 local elections where Labour performed strongly in diverse London boroughs while UKIP surged in seats with concentrations of older, white working class “left behind” voters. The 2015 election is not a national popularity contest but 650 local popularity contests. As we roll out our constituency-level forecasts in the coming months, we will start to analyse how to translate the national picture into a map of the local constituency battles which will ultimately decide who governs after May 2015. 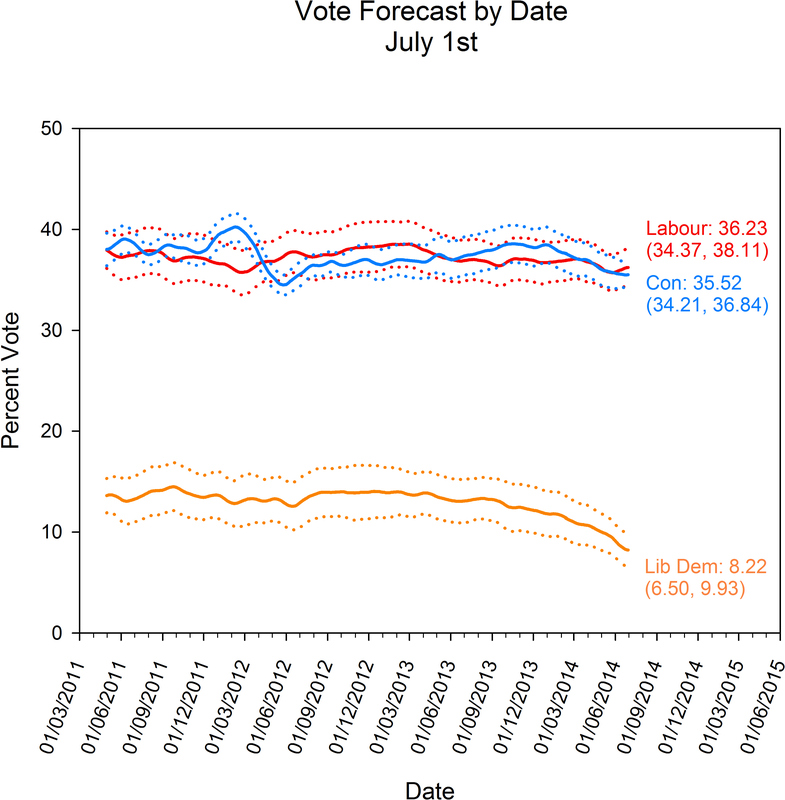 As explained in our inaugural election forecast last month, up until May next year the Polling Observatory team will be producing a long term forecast for the 2015 General Election, using methods we first applied ahead of the 2010 election (and which are also well-established in the United States). Our method involves trying to make the best use of past polling evidence as a guide to forecast the likeliest support levels for each party in next May’s election (see our previous research here), based on current polling, and then using these support levels to estimate the parties’ chances of winning each seat in the Parliament. We will later add a seat-based element to this forecast. In light of the turbulence of the polls over the course of the European election campaign (with a Lord Ashcroft poll showing the Conservatives ahead for the first time since March 2012), inquests into the insipid performance of Labour and Ed Miliband, better than expected results for the Conservatives in local and European elections, and a disastrous showing by the Liberal Democrats, some might have expected a turning point or a step change in the predictions for May 2015 – consistent with the pattern for governments to often recover in the polls during the final year. However, some degree of recovery is already built in to our model and there is, as yet, no evidence that the Conservatives are outperforming the historical trend. 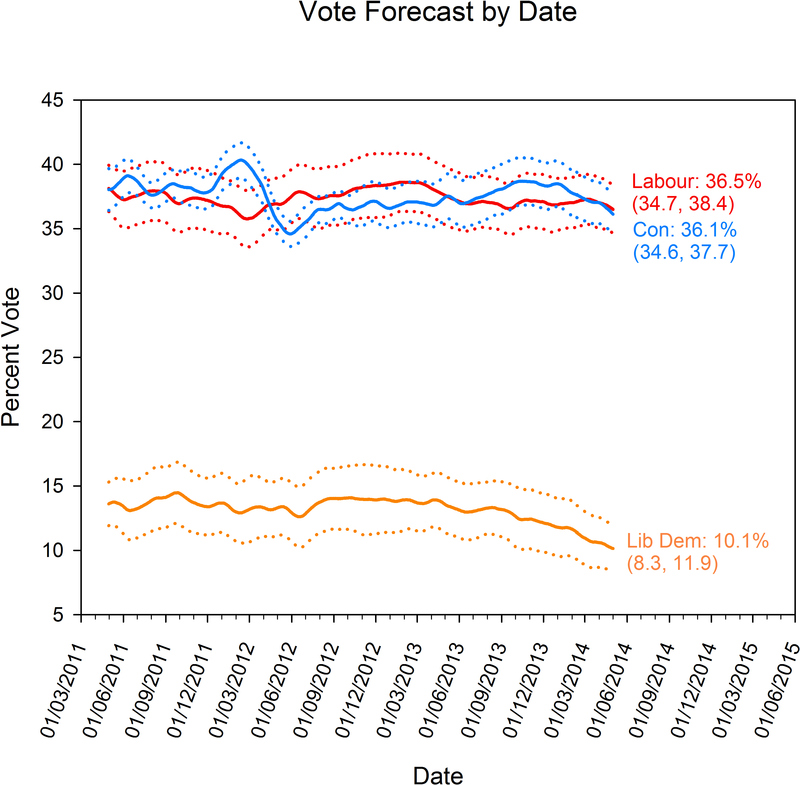 Our forecast puts Labour and the Conservatives in a dead heat, as it did last month. We currently forecast both parties to receive 35.8% of the vote. In part this reflects the very recent uptick in Labour support following a decline over recent months. More significantly, though, it reflects the fact that both parties are polling well below their historical level, and therefore we expect both to make some recovery in the polls. However, the prospect of a recovery to the kind of levels seen by winners in past elections – 40% plus – is tempered by the very low starting point for both main competitors. Both main parties are likely to put in weaker performances than in the past, even with a recovery from the current low ebb, but at present history continues to suggest a very tight race to the finish next spring. This is the thirty-seventh in a series of posts that report on the state of the parties as measured by opinion polls. By pooling together all the available polling evidence we can reduce the impact of the random variation each individual survey inevitably produces. Most of the short term advances and setbacks in party polling fortunes are nothing more than random noise; the underlying trends – in which we are interested and which best assess the parties’ standings – are relatively stable and little influenced by day-to-day events. If there can ever be a definitive assessment of the parties’ standings, this is it. Further details of the method we use to build our estimates of public opinion can be found here. This month’s Polling Observatory comes in the aftermath of the European Parliament elections and the so-called UKIP earthquake for the electoral landscape. Despite much volatility in the polls ahead of those elections, with a few even putting the Conservatives ahead of Labour for the first time in over two years, underlying support for both main parties remained stable over the course of the month. Labour may have fallen early in the month in the run-up to the European elections, or the Conservative leads may have been the result of random variation. In any event, by the end of the month, we had Labour polling at 33.8%, just 0.2 points down on their support a month ago. 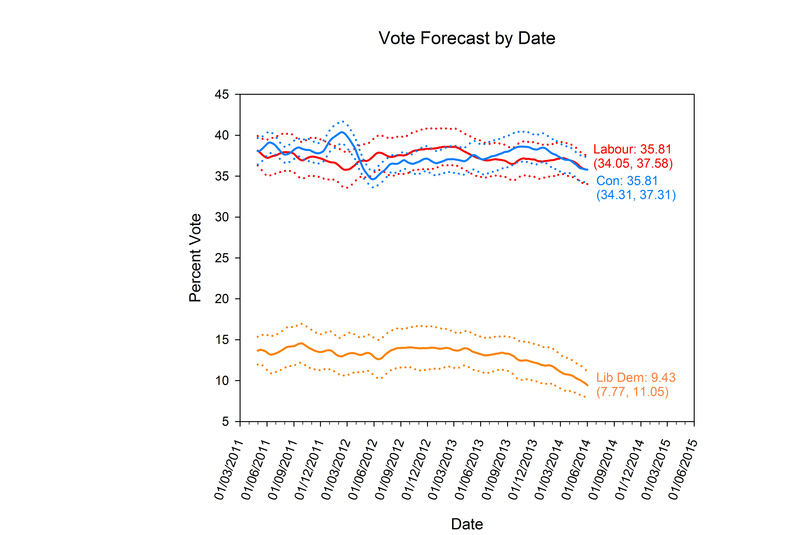 The Conservatives are also broadly flat at 30.9%, 0.3 points below their standing a month ago. The Lib Dems have suffered slightly more of a post-election hangover, perhaps set back by infighting over the botched coup by Lord Oakeshott and the widespread ridicule over the Clegg/Cable beer-pulling photo op, on 9.3%, down 0.4 points. UKIP support remained stable at record high levels, as they enjoyed a moment in the limelight around the European Parliament elections. We have them rising 0.2 points on last month to 14.9%, their highest support level to date. Note that all these figures are based on our adjusted methodology, which is explained in detail below. It is noticeable that while Labour’s support has been in decline for the last six to nine months (having plateaued for a period before that) underlying Conservative support has remained incredibly stable around the 31% level. In fact, setting aside the slight slump around the time of the last UKIP surge at the 2013 local elections, their standing with the electorate has been flat since its crash of April 2012 around the time of the ‘omnishambles’ budget. The narrowing in Labour’s lead over the past year is entirely the result of Labour losing support, not of the Conservatives gaining it. We have written at length previously about how the fate of the Liberal Democrats was sealed in late 2010, and as such it is remarkable that in this parliament there has been so little movement in the polls for the parties in government. The prevalent anti-politics mood out in the country and continued pessimism about personal/household finances has meant that neither of the Coalition partners have yet been able to convert the economic recovery into a political recovery. Instead, both are gaining ground relatively as the main opposition party also leak support, perhaps also succumbing to the anti-Europe, anti-immigration, anti-Westminster politics of UKIP. As explained in our methodological mission statement, our method estimates current electoral sentiment by pooling all the currently available polling data, while taking into account the estimated biases of the individual pollsters (“house effects”). Our method therefore treats the 2010 election result as a reference point for judging the accuracy of pollsters, and adjusts the poll figures to reflect the estimated biases in the pollsters figures based on this reference point. Election results are the best available test of the accuracy of pollsters, so when we started our Polling Observatory estimates, the most recent general election was the obvious choice to “anchor” our statistical model. However, the political environment has changed dramatically since the Polling Observatory began, and over time we have become steadily more concerned that the changes have rendered our method out of date. Yet changing the method of estimation is also costly, as it interrupts the continuity of our estimates, and makes it harder to compare our current estimate with the figures we reported in our past monthly updates. There were three concerns about the general election anchoring method. Firstly, it was harsh on the Liberal Democrats, who were over-estimated by pollsters ahead of 2010 but have been scoring very low in the polls ever since they lost over half their general election support after joining the Coalition. The negative public views of the Liberal Democrats, and their very different political position as a party of government, make it less likely that the current polls are over-estimating their underlying support. 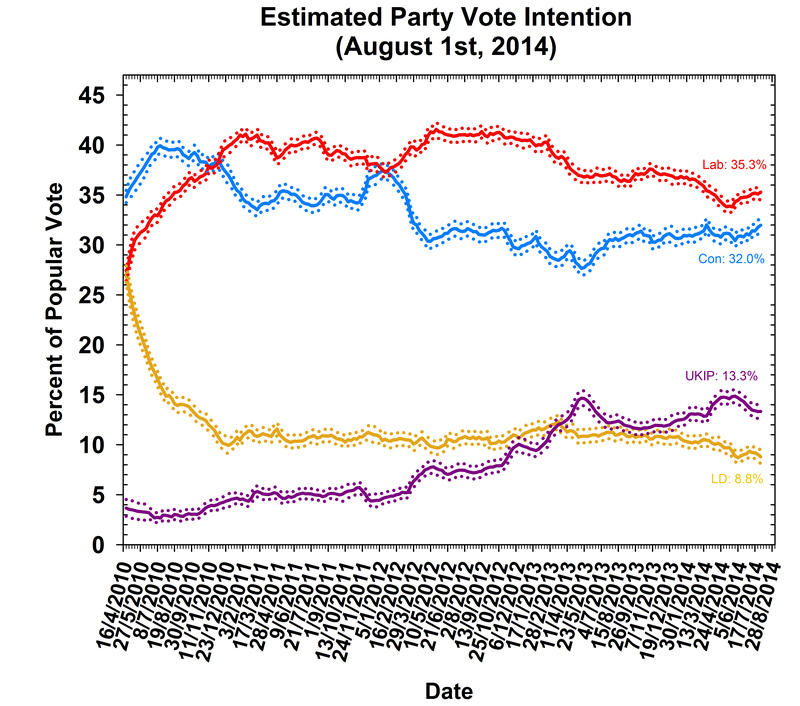 Secondly, a general election anchor provides little guidance on UKIP, who scored only 3% in the general election but poll in the mid-teens now, but with large disagreements in estimated support between pollsters (see discussion of house effects below). Thirdly, the polling ecosystem itself has changed dramatically since 2010, with several new pollsters starting operations, and several other established pollsters making such significant changes to their methodology that they were equivalent to new pollsters as well. We have decided that these concerns are sufficiently serious to warrant an adjustment to our methodology. Rather than basing our statistical adjustment on the last general election, we now make adjustments relative to the “average pollster”. This assumes that the polling industry as a whole will not be biased. This assumption could prove wrong, of course, as it did in 2010 (and, in a different way, 1992). However, it seems pretty likely that any systematic bias in 2015 will look very different to 2010, and as we have no way of knowing what the biases in the next election might be, we apply the “average pollster” method as the best interim guide to underlying public opinion. This change in our methodology has a slight negative impact on our current estimates for both leading parties. Labour would be 34.5% if anchored against the 2010 election, rather than the new estimate of 33.8%, while the Conservatives would be on 31.5% rather than 30.9%. Yet as both parties fall back by the same amount, their relative position is unchanged. UKIP gain slightly from the new methodology – our new estimate is now 14.9%, under the old method they would score 14.5%. However, the big gainers are the Lib Dems, who were punished under our old method for their strong polling in advance of the 2010 general election. We now estimate their vote share is estimated at 9.3%, significantly above the anaemic 6.7% estimate produced under the previous method. This is in line with our expectations in earlier discussions of the method in previous posts. It is worth noting that none of these changes affect the overall trends in public opinion that we have been tracking over the last few years, as will be clear from the charts above. The European Parliament elections prompted the usual inquest into who among the nation’s pollsters had the lowest average error of the final polls compared against the result (see here). 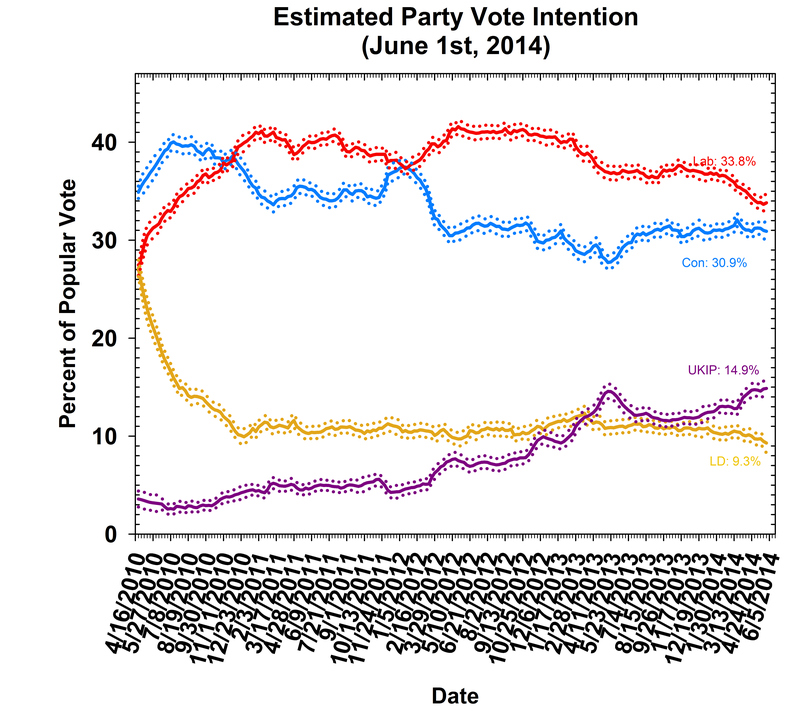 We cannot simply extrapolate the accuracy of polling for the European elections to next year’s general election. For one thing, these sorts of ‘final poll league table’ are subject to sampling error, making it extremely difficult to separate the accuracy of the polls once this is taken into account (as we have shown here). Nevertheless, with debate likely to continue to rage over the extent of the inroads being made by UKIP as May 2015 approaches, some of the differences observed in the figures reported by the polling companies will come increasingly under the spotlight. These ‘house effects’ are interesting in themselves because they provide us with prior information about whether an apparent high or low poll rating for a party, reported by a particular pollster, is likely to reflect an actual change in electoral sentiment or is more likely be down the particular patterns of support associated with the pollster. Our new method makes it possible to estimate the ‘house effect’ for each polling company for each party, relative to the vote intention figures we would expect from the average pollster. That is, it tells us simply whether the reported vote intention for a given pollster is above or below the industry average. This does not indicate ‘accuracy’, since there is no election to benchmark the accuracy of the polls against. It could be, in fact, that pollsters at one end of the extreme or the other are giving a more accurate picture of voters’ intentions – but an election is the only real test, and even that is imperfect. In the table below, we report all current polling companies’ ‘bias’ for each of the parties. We also report details of whether the mode of polling is telephone or Internet-based, and adjustments used to calculate the final headline figures (such as weighting by likelihood to vote or voting behaviour at the 2010 election). From this, it is quickly apparent that the largest range of house effects come in the estimation of UKIP support, and seem to be associated with the method a pollster employs to field a survey. All the companies who poll by telephone (except Lord Ashcroft’s new weekly poll) tend to give low scores to UKIP. By contrast, three of the five companies which poll using internet panels give higher than average estimates for UKIP. ComRes provide a particularly interesting example of this “mode effect”, as they conduct polls with overlapping fieldwork periods by telephone and internet panel. The ComRes telephone-based polls give UKIP support levels well below average, while the web polls give support levels well above it. It is not clear what is driving this methodological difference – something seems to be making people more reluctant to report UKIP support over the telephone, more eager to report it over the internet, or both. The diversity of estimates most likely reflects the inherent difficulty of accurately estimating support for a new party whose overall popularity has risen rapidly, and where the pollsters have little previous information to use to calibrate their estimates.